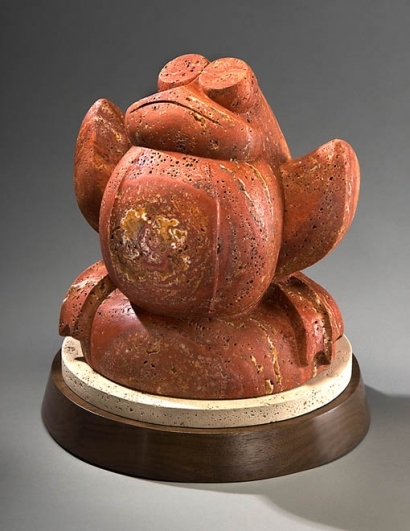 “One Handsome Frog” was completed shortly before Sculpture in the Park. I never found the time to post this stone sculpture until now. I was racing to meet the show deadline and then was on to the next project. Here, finally, is the frog. This is the first sculpture in a series I am carving on endangered species. Frogs and amphibians are disappearing on every continent in the world. This is due to the rapid spread of a skin fungus called chytrid, which spreads through water. National Geographic published an article about the plight of the world’s frogs and amphibians. It depressed me completely to think of a world without these creatures. Then I started thinking about a world without polar bears and tigers and ocelots. These scary thoughts prompted me to begin a series on endangered species. I want to lend some visibility to the precarious situation of these animals and to send out a hope that we can share the earth with them. This is no particular species of frog, but rather stands as a symbol for all frogs. The stone is Persian Red Travertine, the same stone from which I carved “Magic Lesson“, the dragon. The colored stripes of red, orange, and yellow, along with the many porosities (vugs) in the stone seemed appropriate for a frog skin. The “rose” on the frog’s tummy was a gift from the stone and happened when I carved through these many-colored layers on the curve. The stone is the star in this sculpture, so I chose large simple shapes as the design elements to insure that the forms would read. Detail would have been lost in such a “busy” stone. I am particularly fond of the eyes on this frog as they lend a humor and appeal. I hope this piece expresses my feelings that frogs are significant in our world and worth every effort to save them from extinction.